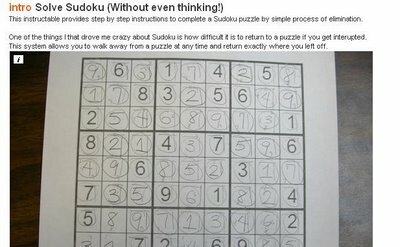 Instructable's user delgaudm has a provided step-by-step instructions on how to solve a Sudoku puzzle without thinking. He (?) takes you through a nine step process of elimination, illustrated with a sample puzzle. 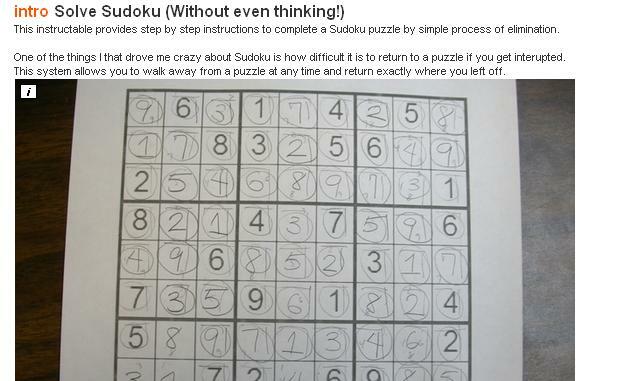 I've seen other tutorials on solving Sudoku puzzles, but this is easily my favorite. It's concise, and I like the use of pencil and paper in illustrating the process. A warning though: after learning the solution process, you might be a little less thrilled at playing Sudoku since it kind of becomes a mechanical process. Just work through the steps, and you'll be able to solve any puzzle.